Learn how to manage projects using Kanban and how agile software development can help you better manage your projects. 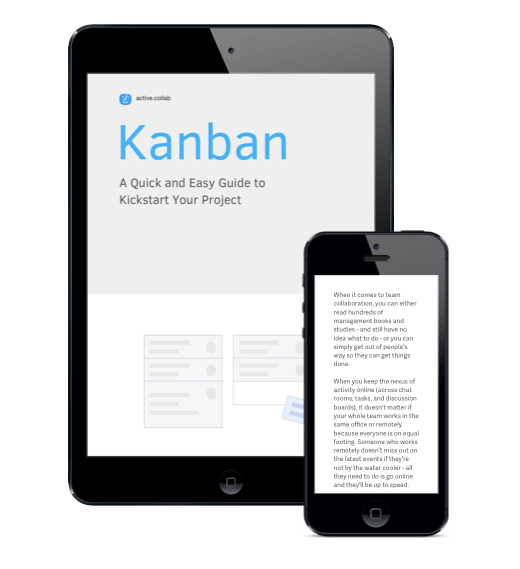 Step-by-step guide on implementing Kanban, the most popular project management methodology. Tips and tricks on best ways to organize projects. How to collaborate better and deliver more value to clients. If you’re in IT, you've probably lived through this: clients demand last minute changes on a tight budget, you don’t know what the other developers are doing, your work keeps overlapping, and you wonder how they come up with those unrealistic estimates. This is a quick read. By the time finish, you'll have a basic understanding of Kanban - and more importantly, how to start using it. We focus on the practical part and show how to avoid some common pitfalls. Everything you read here, you can apply right now in ActiveCollab and start managing your projects more efficiently. Kanban is a Japanese word which roughly translates to “a card you can see”. Basically, you organize tasks as cards on a board (or in a software). You then track progress by moving them across different columns. Let's say you’re developing a mobile app. You create several columns in the project: TO-DO, IN PROGRESS, REVIEW, DONE. Then you create and put all the tasks in the TO-DO column (eg. create a wireframe, design icon packs, write API calls, choose fonts and colors, fix loading bug). When you start working on the wireframe, you move the card to the IN PROGRESS column. When it’s finished, it goes to REVIEW. The client can see what’s in REVIEW and give feedback. If it’s good, you move it to DONE — if not, the card goes back to IN PROGRESS. A common way to organize projects is by task types (like DESIGN, DEVELOPMENT), but that's not appropriate in Kanban because a task can't travel from one column to another. For example, a task like "Export hi-res logo" in DESIGN task list can't travel to DEVELOPMENT task list. But a feature request like "Put number of active users on admin dashboard" can travel from BACKLOG to DEVELOP to REVIEW. As you can see, Kanban is very simple to use. It’s applied in logistics, software development, and even as a productivity method to organize personal tasks. All you need is a big board that everyone on your team can see and pin cards to. But in this book, we are relying on ActiveCollab because it makes the process more efficient with features like @mentions, notifications, labels, assignees, due dates, filters, and more. To get started, create a new project and add four task lists: TO-DO, IN PROGRESS, REVIEW, and DONE. Next, add everything that needs to be done in the TO-DO culumn. Decide who’ll be in charge of what, who’ll do the reviewing, and how you'll notify each other. Let your team pick their tasks and move them to IN PROGRESS once they’ve started working. If someone needs to know about updates on a task, you can subscribe them so they’re notified about each update. When you finish, move the task to the REVIEW column. If you're in a hurry, you can @mention the person who needs to do the review, or wait for them to check the column themselves when they have time. If the work is good and the task passes review, it can be moved to DONE. If it needs more work, the reviewer moves it back to the IN-PROGRESS column and writes what needs more grease in the comments section. As you can see, Kanban is pretty simple. To learn more (like Push vs Pull principle, various workflows, etc), download the ebook which delves further into the topics.